In 2008 I watched Waterloo, a documentary by filmmaker Tom Zubrycki, and I was left wondering why I’d not taken the time to watch before. 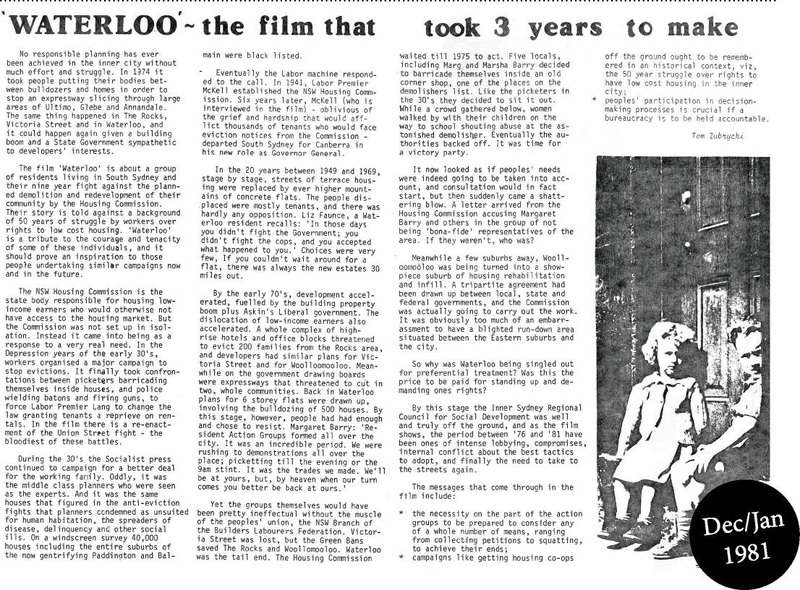 “Waterloo” is an historical account of the 1970s battle by residents of this inner Sydney suburb of Waterloo to save the area from ‘slum clearance’ and redevelopment by the old Housing Commission. In the early 70s the state government initiated a massive scheme to pull down inner city terraces (slums) to build the new public housing estates that the government now wants to redevelop. Waterloo sets out to understand the residents fight-back in terms of the history of the suburb itself: the poverty and overcrowding at the turn of the century, and the impractical, idealistic solutions proposed by the planners of the day. The film also looks at Waterloo in the context of urban housing struggles in Sydney: the anti-eviction campaigns of the 1930s, the rise of the Resident Action Movement in the late 60s and the alliance it formed with building unions resulting in the now famous “Green Bans”. In the process the film reveals the history of the Housing Commission and the inner city Labor machine, prompting questions about the planning process, community involvement and bureaucratic accountability. How did the Housing Commission, a public housing authority set up by the state Labor government in the 40s, get to the stage of evicting workers to build more public housing? I recommend this film, not only for its historical documentary value, but for its value as a motivational tool for people seeking to engage tenants in tenant participation, activism and lobbying. The film makes no bones about it, the struggle to get a fair deal for people living on very low incomes – indeed in abject poverty – has never been an easy one. As the film shows, the path can be fraught with unexpected barriers, including government sanctioned dirty tactics and police hoodlumism, of the kind one usually associated with that depicted in old Hollywood gangster movies. The film includes eyewitness accounts of police smashing down doors, guns ablazin’, shooting squatters as a means of evicting them from the homes bulldozed to make way for the housing estates of the future. But the film also depicts the ability of motivated, passionate people to join together, and as one united community, take the fight to government. There is a lot the residents of Waterloo didn’t win; they sacrificed a great deal for the fight, but there is a great deal they didn’t sacrifice, including their self-respect, their respect for each other and their community, their dignity! Need a reminder of what that ANZAC spirit is all about? Get a copy of Waterloo. No responsible planning has ever been achieved in the inner city without much effort and struggle. In 1974 it took people putting their bodies between bulldozers and homes in order to stop an expressway slicing through large areas of Ultimo, Glebe and Annandale. The same thing happened in The Rocks, Victoria Street and in Waterloo, and it could happen again given a building boom and a State Government sympathetic to developers’ interests. The film ‘Waterloo’ is about a group of residents living in South Sydney and their nine year fight against the planned demolition and redevelopment of their community by the Housing Commission. Their story is told against a background of 50 years of struggle by workers over rights to low cost housing. ‘Waterloo’ is a tribute to the courage and tenacity of some of these individuals, and it should prove an inspiration to those people undertaking similar campaigns now and in the future. The NSW Housing Commission is the state body responsible for housing low-income earners who would otherwise not have access to the housing market. But the Commission was not set up in isolation. Instead it came into being as a response to a very real need. In the Depression years of the early 30’s, workers organised a major campaign to stop evictions. It finally took confrontations between picketers barricading themselves inside houses, and police wielding batons and firing guns, to force Labor Premier Lang to change the law granting tenants a reprieve on rentals. In the film there is a re-enactment of the Union Street fight – the bloodiest of these battles. During the 30’s the Socialist press continued to campaign for a better deal for the working family. Oddly, it was the middle class planners who were seen as the experts. And it was the same houses that figured in the anti-eviction fights that planners condemned as unsuited for human habitation, the spreaders of disease, delinquency and other social ills. On a windscreen survey 40,000 houses including the entire suburbs of the now gentrifying Paddinaton and Balmain were black listed. Eventually the Labor machine responded to the call. In 1941, Labor Premier McKell established the NSW Housing Commission. Six years later, McKell (who is interviewed in the film) – oblivious of the grief and hardship that would afflict thousands of tenants who would face eviction notices from the Commission -departed South Sydney for Canberra in his new role as Governor General. In the 20 years between 1949 and 1969, stage by stage, streets of terrace housing were replaced by ever higher mountains of concrete flats. The people displaced were mostly tenants, and there was hardly any opposition. Liz Faunce, a Waterloo resident recalls: ‘In those days you didn’t fight the Government; you didn’t fight the cops, and you accepted what happened to you.’ Choices were very few, If you couldn’t wait around for a flat, there was always the new estates 30 miles out. Yet the groups themselves would have been pretty ineffectual without the muscle of the peoples’ union, the NSW Branch of the Builders Labourers Federation. Victoria Street was lost, but the Green Bans saved The Rocks and Woollomooloo. Waterloo was the tail end. The Housing Commission waited till 1975 to act. Five locals, including Marg and Marsha Barry decided to barricade themselves inside an old corner shop, one of the places on the demolishers list. Like the picketers in the 30’s they decided to sit it out. While a crowd gathered below, women walked by with their children on the way to school shouting abuse at the astonished demolisher. Eventually the authorities backed off. It was time for a victory party. It now looked as if peoples’ needs were indeed going to be taken into account, and consultation would in fact start, but then suddenly came a shattering blow. A letter arrived from the Housing Commission accusing Margaret Barry and others in the group of not being ‘bona-fide’ representatives of the area. If they weren’t, who was? Meanwhile a few suburbs away, Woolloomooloo was being turned into a showpiece suburb of housing rehabilitation and infill. A tripartite agreement had been drawn up between local, state and federal governments, and the Commission was actually going to carry out the work. It was obviously too much of an embarrassment to have a blighted run-down area situated between the Eastern suburbs and the city. So why was Waterloo being singled out for preferential treatment? Was this the price to be paid for standing up and demanding ones rights? By this stage the Inner Sydney Regional Council for Social Development was well and truly off the ground, and as the film shows, the period between ’76 and ’81 have been ones of intense lobbying, compromises, internal conflict about the best tactics to adopt, and finally the need to take to the streets again. peoples’ participation in decision-making processes is crucial if a bureaucracy is to be held accountable.